WIN Entertainment Centre Offers a high-end Audio Visual, technical and staging service in-house, delivered by national AV group ARENA AV. With an eye for detail, their dynamic and skilled team uses the latest AV & Lighting technology and only invest in the latest industry brands to maintain excellent service for clients. Allow experienced professionals to light up your corporate or entertainment event. Whether you’re looking for a meeting room projector for a presentation or a large full event production service then ARENA AV have the equipment and technical staff to make your event a success. 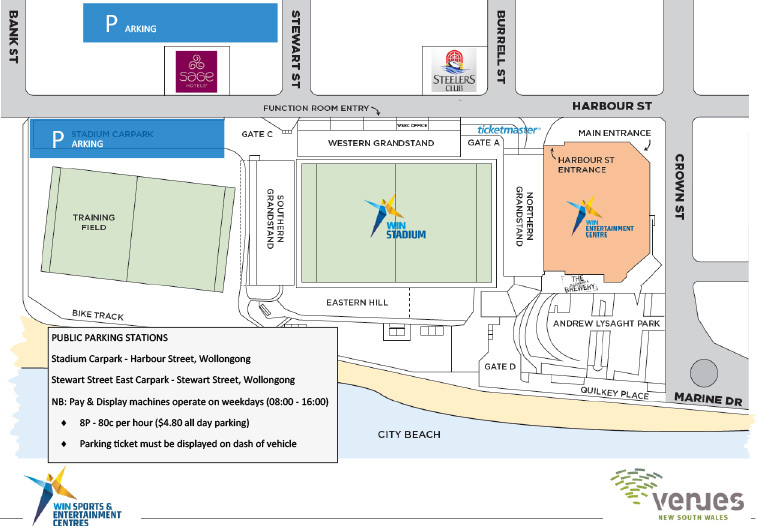 Stadium Car Park – Located behind the Southern Grandstand – Harbour & Steward Street. Pay & Display – Monday to Friday 8:30am-4:30pm. Free after 5pm Monday to Friday & weekends.